Deferred adjudication is the cause of a lot of confusion among defendants and attorneys. The main reason- deferred cases (except traffic tickets) can NOT be expunged. That pot case you took deferred probation on 5 years ago…. still on your record. Luckily, there are Texans dedicated to reforming this system and giving deserving defendants a clean record. 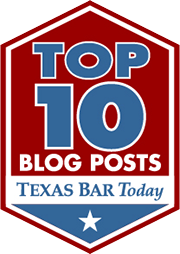 Here is an Interview with Rob Sandifer of the Texas Association for Justice and Legal Reform. (2) What changes do you want made to deferred adjudication? I approach this question from two angles (A) criminal records expunction reform AND (B) reviewing the appropriateness of awarding deferred adjudication for certain offense classifications. For (A), the change that is fair and necessary is simple: Remove the bar to expunction found in TCC 55.01. For (B), I personally feel that certain types of offenses should not even be statuorially allowed (murder, kidnapping, etc, etc) and the laws should be changed to reflect that. (3) Why should Texans care about deferred adjudication reform? Texans, by and large, should care about deferred adjudication reform for many reasons; a few of them I will mention here. It is a fact that nowadays, most Texans know of someone who has been placed on deferred adjudication probation. Texas Department of Public Safety statistics confirmed in 2005 that there are currently approximately 2 million Texas citizens whom, at one time or another, have been placed on community supervision. Many of these people continually have a very difficult time finding employment, housing, etc as a direct result of having a criminal record associated with their deferred adjudication. This, in and of itself should be of a major concern to ALL Texans, whether or not they have been personally impacted by deferred adjudication. Having a large segment of the population unemployed results in a chronic loss of production and human capital and the only way many of these people can survive is to resort to stealing and other dishonest means of making a living in order to feed themselves and their families. The main reason that Texans should be concerned about deferred adjudication reform is that one day, they themselves may be impacted by it in a very personal and devastating way! Just one: Citizens of our state and country have a responsibility and duty to hold their public officials accountable for their actions. If we as free citizens abdicate that responsibility, then we have absolutely no right nor reason to complain about the inevitable consequences; passing of bad laws, corruption, etc. I practice what I preach. For a number of years, I have been at the forefront of a statewide movement to reform the expunction laws and I will continue to do so until expunction reform is the law of the land. I agree. What I find so particularly repugnant about it is that the whole thing is based on a lie. Prosecutors get guilty pleas with the promise of DA. They tell the defendant that if they complete probation, it won’t be a conviction and it won’t be on their record. It may not be technically a conviction, but it has the same effect. As you say, it keeps people from getting jobs, housing, credit, etc. If defendants knew the truth, they might fight the case and make the prosecution actually make a case or drop it. Also, some defense attorneys apparently think it is taken off the record, as well. I didn’t know you couldn’t get it expunged; I thought the hitch was that most people thought it automatically went off upon completion of probation. This is even worse. I am a victim of a dismissed case otherwise known as “set aside”. The conviction was dismissed and I was supposed to be free from the penalties and disabilities of this conviction. I am not and this was in 1975! How can I help with this reform?